The death by vaporization of the 47-year old Saad Hariri factotum, Wissam Al-Hassan, formerly the head of the Internal Security Bureau – Information Branch, has generated some fascinating data for those analyzing events in Lebanon and Syria. I’m going to be brutally frank in light of data coming into my office from Beirut, Sidon and Tripoli. Jihad, a close friend who lives near Remeileh, sent me an e-mail for the first time last night. He asked me in Arabic how I could distinguish the explosion which killed Al-Hassan from the one which killed Rafic Hariri? Both explosions were clearly engineered by experts using very advanced techniques. One difference might be the use of military grade TNT to kill Hariri and his entourage, as I wrote back to him, while it appears that Al-Hassan’s killers used PETN or C-4 with an enhancer. How do I know? Abed told me that by phone this morning before I left for court. Abed says that his friend, in what he called the “Deuxieme Bureau”, indicated that early analysis showed a residue consistent with a plastic explosive. But Jihad went on to ask, almost in a Socratic style with a whiff of the rhetorical: What would be the benefit of re-igniting a Sunni back-lash at a time when Syria and Lebanon were trying to put a lid on any sectarian explosion? This question goes to motive of the killers. I cannot answer it in good faith because it avoids the most obvious answer; the answer which comes easiest to mind. I told Jihad he should look at the sequence of events from the time of the arrest of Michel Samaha to the recent explosion in Al-Ashrafieh. I will not mention the names of organizations which I believe could be capable of assembling the necessities for this operation. I do know that legal efforts to get the Lebanese courts to grant bail have failed so far and that Michel Samaha is an highly regarded personality among pro-Syrian groups. I also know from contacts in the Ministry of “Justice” that the “Sa’id Merza Syndrome” is alive-and-well in Beirut, thanks to Saad Hariri and his “legal experts”. As we wrote before, Samaha was entrapped by one of Al-Hassan’s agents, who pretended to represent Syrian Lt. General Ali Mamlouk (a Sunni) who was Director of General Security before his recent “promotion” to Special Advisor to President Assad. The undercover agent tricked Samaha into believing that General Mamlouk wanted him to “smuggle” some unnamed material into Lebanon. Anti-Syrian Lebanese press jumped on the bare facts and added language suggesting that General Mamlouk wanted to start a Lebanese crisis to divert attention from events in Syria. Lebanon’s hypocritical justice system is applied unevenly whenever a Sunni leader loyal to Hariri is killed. When pro-Syrian Rashid Karameh was murdered, no one even shrugged. Michel Samaha must be treated like any Lebanese citizen deserving all protections under the constitution. The pace of Samaha’s legal proceedings in the Military Court is reminiscent of the detention of the four Lebanese generals after Rafic Hariri’s assassination in February of 2005. There seems to be some kind of recognized state of legalo-stasis which permits the government to marginalize both the constitution and criminal statutes in order to please wealthy, Saudi-backed, French-protected lice like Saad Hariri and his minions. The four generals were imprisoned without charge at the Roumieh Prison for not less than four years before Judge Daniel Bellemaire’s report came out pointing a finger away from them and at four other, alleged agents of Hizbollah. This absurd scenario, reminiscent of Kafka, cannot be played out again. The assassination of Al-Hassan was just such a message. What added to the repulsive nature of Al-Hassan’s accusations against Samaha was the startling revelation that Samaha admitted to ferrying explosives into Lebanon because that was what “Assad wanted”. This blood libel was disseminated by anti-Syrian monkey-news services like Al-Arabiyya and Al-Jazeera which did not mention that Samaha was tortured into making statements against interest. Samaha never knew he was transporting anything for the purpose of igniting a war. The bare evidence indicates that he thought Gen. Mamlouk wanted to bring something into Lebanon to be transferred to the Northern Akkar region. This is where the French spies are located. Remember them? The narrative disclosed by Al-Hassan’s creeps was so plainly offensive – so improbable that those who listened to it felt as though they had been mistaken for seven year old children. One story reported to the press by Al-Hassan’s agents was that Samaha declared that: “Gen. Ali Mamlouk himself handed the bombs to me along with $170,000 to be paid to the perpetrators”. For Pete’s sake!! General Mamlouk does not dabble in bombs or their transportation. Gen. Mamlouk has never, in his career as a high ranking officer, handed American dollars or Syrian Lira to anyone as payment for services. The story is so ridiculous that you rarely hear it repeated today except at SyrPer. It would be in Lebanon’s interest to insure that Michel Samaha has access to all protections afforded Lebanese citizens, regardless of their creed or sect. If Lebanon is going to revert back to the days of corrupt officials like Sa’id Mirza, these explosions will not stop. Which gets us to Hariri’s thugs. Please note, that the Sunni protesters flooding the streets of Beirut and Tripoli are all from the poorer areas where irrational sectarianism is particularly prevalent. This is the same in Syria. In Beirut, it’s the Tariq Al-Jadida District with its butcher shops and small service or retail shops; half the population in Tariq Al-Jadida is made up of taxi drivers. In Tripoli, as always, it’s the unemployed vermin in Bab Tabbaneh (Ar. “Milky Way” if you can believe it) who constantly hector the people of Jabal Muhsin, a largely Alawi enclave. These are Hariri’s rats. Among each group are paid “zlaam” who take their orders directly from “The Great Clown” in Paris. Whenever a protest takes place with these rubes, five will get you one it was on the order of that Hariri character. Don’t you believe he has called for “calm”. The unrest would never have taken place but for his order. “Atsa ma boy!”, shouts Rafic Hariri from his tomb near Martyr’s Square in Beirut where the spooky Wissam Al-Hassan’s paltry remains will be interred. AND GET THIS DOSE OF HYPOCRISY FROM EUROPE. SYRIA RESERVES THE RIGHT TO JAM ANY EURO SATELLITE IF THE EUROPEAN UNION BLOCKS OUR OR IRAN’S TRANSMISSIONS FOR POLITICAL REASONS. You want to know why the Banana Emirates do what they do? Read this insightful article and be free of any misconceptions. The Arabians are vermin! This article is interesting because of the unabashed depiction of Sunni sectarianism proving once again that the Ba’ath Party or the SSNP is the only way out of the quagmire of confessionalism. 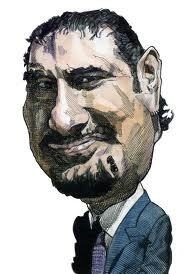 Here’s a loopy article about Wissam Al-Hassan which has some nice points:. AND NOW, HOTBIRD HAS SUSPENDED SYRIA’S BROADCASTS: WE AT SYRPER CALL ON ALL LOYAL AND PATRIOTIC SYRIANS AND ALL OUR ALLIES TO PUNISH HOTBIRD.